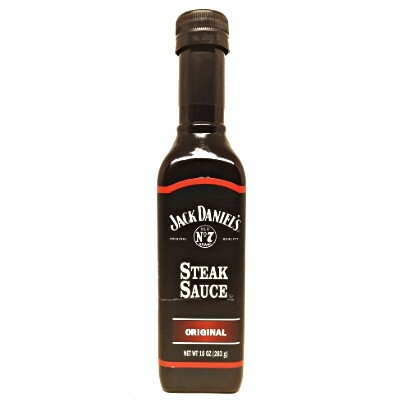 Jack Daniel's Original Steak Sauce tastes great with steak, roast beef, and hamburgers too! It's also the perfect accoutrement for anything grilled whether it be beef, pork or chicken. 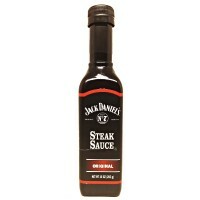 Pick-up a bottle or two of Jack Daniel's Steak Sauce to keep in your pantry and set your taste buds ablaze with flavor. Tomato concentrate (tomato paste, water), high fructose corn syrup, distilled white vinegar, corn syrup, salt, molasses, raisin juice concentrate, water, 2% or less of: apple cider vinegar, modified food starch, Jack Daniel's Tennessee whiskey natural and artificial flavors, color E150 (sulfites), onion, orange puree, garlic powder, onion powder, acidity regulator E330, spices, natural flavors, soy sauce (water, salt, hydrolyzed soy protein, corn syrup, color E150), lemon puree, preservatives E202-E211, thickening agent E415, grapefruit puree, natural mesquite smoke flavor, anchovies (fish), emulsifiers E433-E471-E322 (coconut, soy lecithin), invert sugar, sugar. Contains GMO. Nutrition facts (for 100g): calories 133Kcal, total fat 0g (saturated fat 0g), total carbohydrate 26.7g (sugar 20g), protein 0g, salt 3.5g.